Hummingbirds can always make you happy! Unless, of course they dart into you and poke your eye out! But, luckily, that’s never happened in Todd’s Backyard!….Yet! We have at least 6 varieties of hummingbirds through out the year. Sometimes there’s a few others that migrate through in the fall and spring. But, on any given day, there are a least 25-30 hummers. 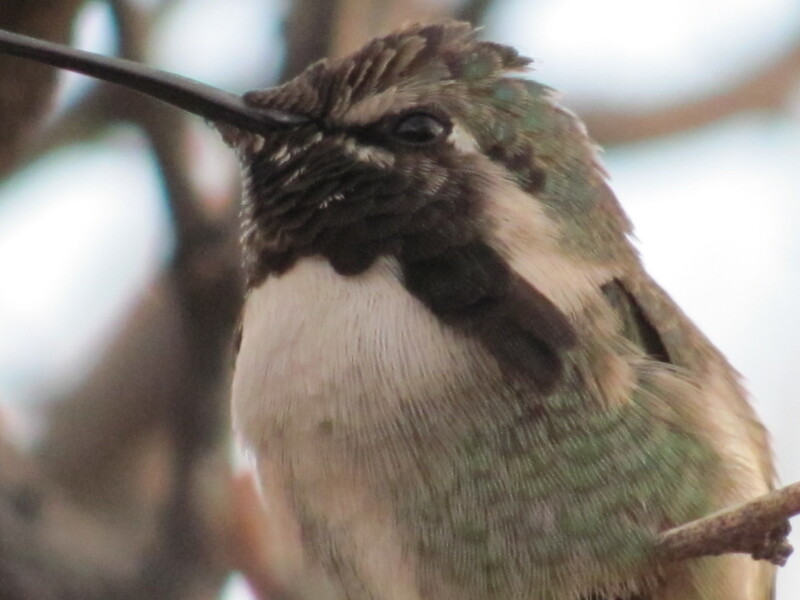 During migration season, it’s Hummingbird wars! You have to be on your toes and literally dodge out of their way, as they chase each other around the yard, fighting for feeder time! 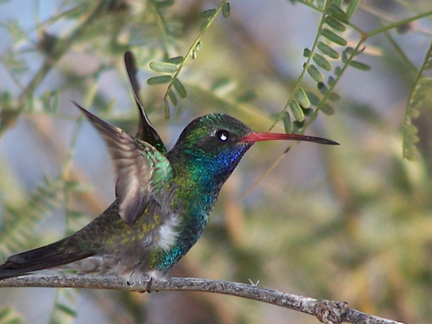 This is a ‘Costa’s’ Hummer…It’s too bad we didn’t capture this shot in better light. The dark areas on his neck are deep purple. Amazing! 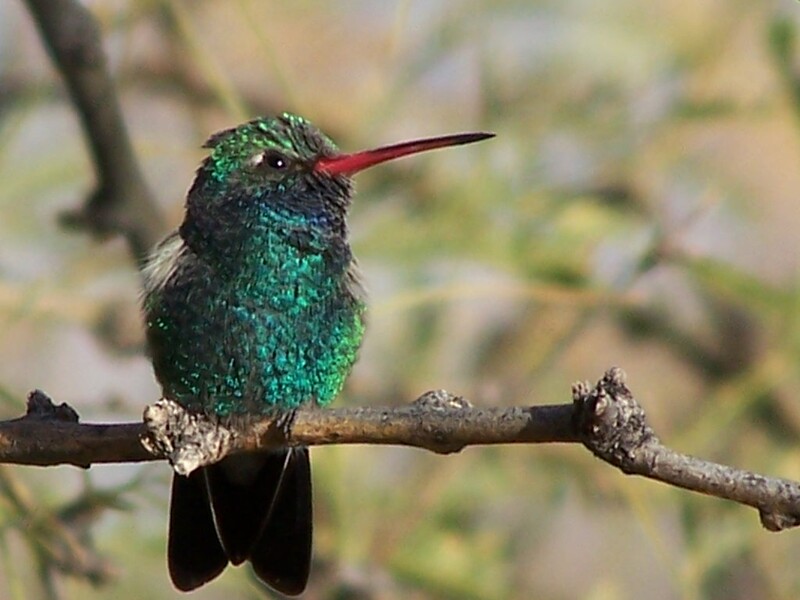 This is one of our favorite little jewels…..a Broad-billed hummingbird. A dazzling blue-green, these guys are the most easily recognizable. Some species look very similar, so we keep our hum-dentifier handbook handy! 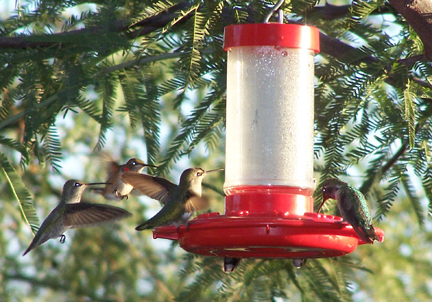 In the spring and the fall, our hummingbird feeders look like this…all 6 of them! Todds’ hummingbird food recipe: 1 part sugar, 4 parts water. Bring to a boil, then cool. An ‘Anna’s’ Hummingbird- A gorgeous redhead for sure! We still haven’ t got a great shot of a Rufus hummingbird- They are gorgeous- A fiery orange-red! They are vicious! This is a special little hummer! She was imported from Tucson. Trapped in a warehouse where Todd works, she spent hours of panicked frenzy trying to find the way out. Todd’s only solution, was to wet her down, so she would land. Todd could then catch her and release her back outside. The plan worked, except wetting her down put her into a hibernation mode- she was too cold! Because it was the end of the day, and the sun would soon set, Todd had no choice but to bundle her up and bring her home! When Todd got her home, we put her on the porch in the waning sun. I kept trying to force a dropper of life-saving sugar food into her beak. Finally. her little tongue started to flicker. It took about 15 minutes of feeding and sunbathing to revive her. Suddenly, she flew up onto the nearest branch and took in her new surroundings. 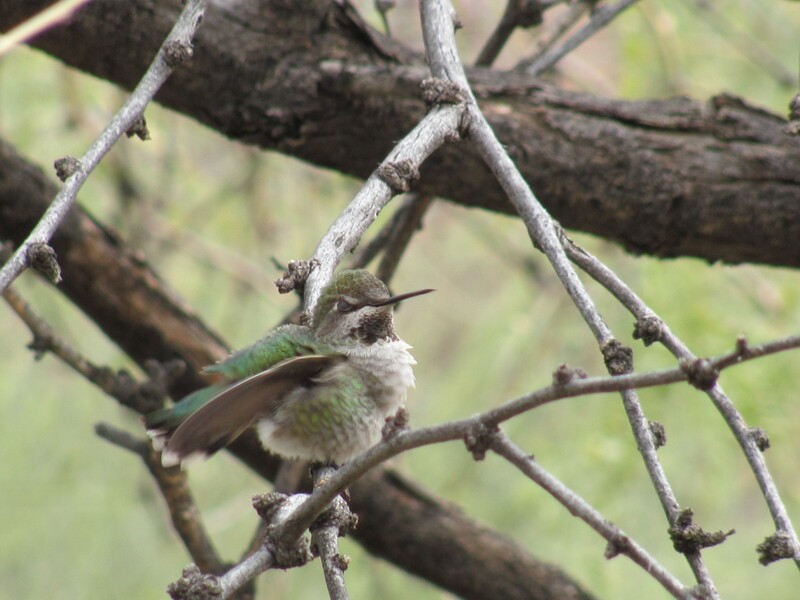 Immediately, several other hummingbirds swarmed around her. The little buzzing bullies tried to chase her away. But still too weak, she stood her ground. As the sun was setting, we saw her buzz off into the dusky desert. The next morning, we were delighted to see, she was the first one on the feeder! She hung around for several days, made some friends, and possibly made here home around here. I don’t actually know if she’s a she or a young he. We think that it is a Broad-tailed Hummer. 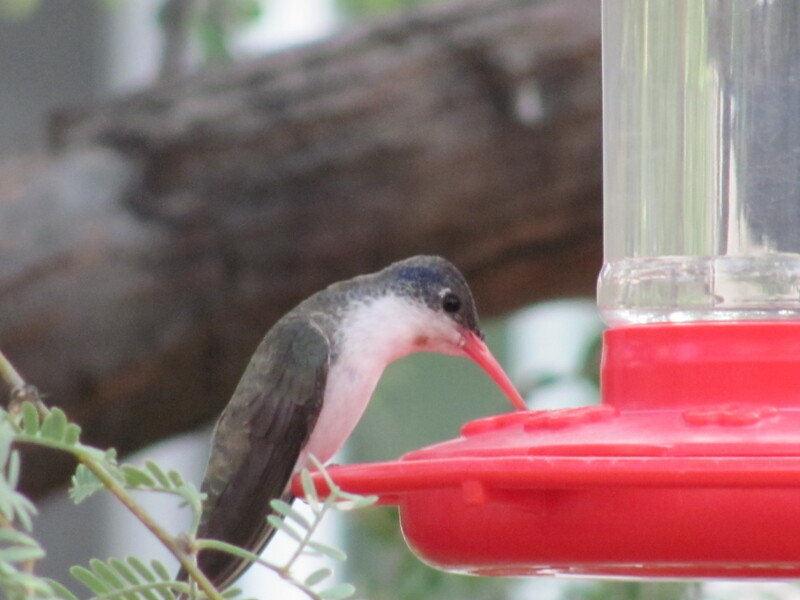 Slightly different than many of the other hummingbirds that frequent Todd’s Backyard. All-in-all, it was a happy ending! 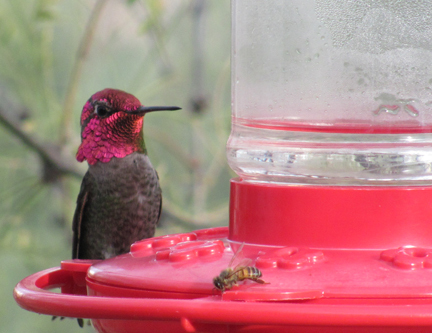 The hummingbirds in Todd’s Backyard are very willing models! We’ll have lots of shots to share in posts to come….hopefully the elusive Rufus will be featured soon! ← Salmon ala Todd….A delicious weekend! Hey! What an awesome blog and fabulous photos! I must come for a weekend and demand Todd’s salmon and then to just sit in the backyard and enjoy cocktails! Hey Roomie! Love to have you come anytime and enjoy the yard,the food,the critters and the cocktails! Can’t believe how lucky I’ve been….to be blessed with a hubby who considers yard work and cooking inspired action, rather than just work!….Ah, the key to a happy life! Caroline…thank’s so much for your kind comments! I’m glad you guys are enjoying! There are so many stories here to share. I love doing this! Everything I write is from personal experience…everything you see on this blog is and has been photographed in our backyard by my husband Todd, or by myself. Thanks for checking it out! Glad you are enjoying…thanks for reading! I love Hummingbirds and have at least 30 Ruby Throated right now. I live in South Louisiana so they are getting ready to migrate to South America. I was able to pet a couple last weekend since they are so accustomed to me being there to refill the feeders. I have ten up and have to refill daily. We are right in the middle of migration season, so it’s actually almost dangerous to sit on our patio, with the ‘hummingbird wars’ going on! Thanks for reading and commenting on our little blog!